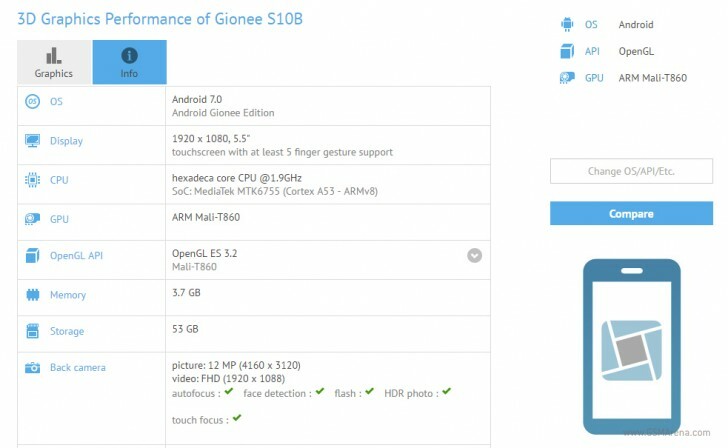 The Gionee S10 was certified for sale in China by TENAA last week, and today someone in possession of a prototype thought it was a good idea to have it run GFXBench. Thus, as always, the benchmark has stored quite a few details about the phone's specs in its database. Let's just get one thing out of the way first. For whatever reason, GFXBench seems convinced that the S10 has a 12 MP rear camera, but that's not true - the TENAA listing details a 13 MP + 13 MP dual camera arrangement. The rest of the specs are aligned, however. The S10 will have a 5.5-inch 1080p touchscreen, 4GB of RAM, 64GB of built-in storage, and a 16 MP camera for selfies. It's powered by the MediaTek MT6755 Helio P10 chipset, which has a 2 GHz octa-core Cortex-A53 CPU. The device runs Android 7.0 Nougat. According to past leaks, it should be kept running by a 3,700 mAh battery. The S10 is going to be available in gold and black, and we assume that its announcement is right around the corner at this point. I keep asking myself this question as well. When oppo did it, no one cared, but because apple does it, they get a ton of heat. "Hexadecacore chipset", according to GFXBench. Mediatek is infamous for including more and more cores but 16 cores? Damn, that's a new height.